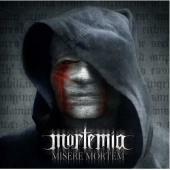 MORTEMIA is the latest from Morten Veiland (ex. TRISTANIA, SIRENIA). The aim of this project is to unite classical music and metal. The vocals are shared betwixt Morten and a choir, a classic beauty and the beast methinks. No female vocalists, though. This is apparently an attempt to avoid sounding like most of the competition. This is unique and melancholic according to the info sheet – lets give it a try. “The One I Once Was” is bombastic; a neat choir meets a brutal vocalist. Morten handles all instruments himself. He does not suppress his metal; he only lets the choir make it a bit more beautiful. It seems to participant needs to hold back, and Morten has created a well-balanced soundscape. The album is Gothic but not depressed, even though the songs delve on subjects such as self-destruction, pain and cruelty. Classical music and metal match each other in more ways than the old traditional 80´s ways. My personal favorite is the grand and varied “The Malice of Life´s Cruel Ways”, followed closely by the amalgam of old-fashioned hardrock and choir-speckled modern metal, “The Vile Bringer of Selfdestructive Thoughts” . The album is a meeting point for classical and metallic music in a very elaborated way. It doesn’t get much better than this in this genre; that is for sure. That is my resume of this highly recommended album.